Kids Shouldn’t Go To School! What I mean is: Schools should go to kids – meet them on their turf. Use the technology they use on a day-to-day basis. I’d argue that it’s quite possible (and quite likely in a lot of cases) that these kid’s aren’t genuinely engaged at all. They’re just playing the game. Playing the system. And the system rewards them. Blatantly thieving from Dan Pink – True engagement requires three things. 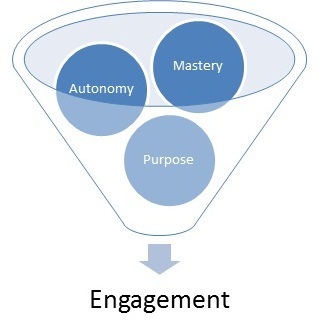 Autonomy – To choose how, what, where and when students learn. Mastery – Learning for the sake of getting better – regardless of whether you need to know it or not for the test. 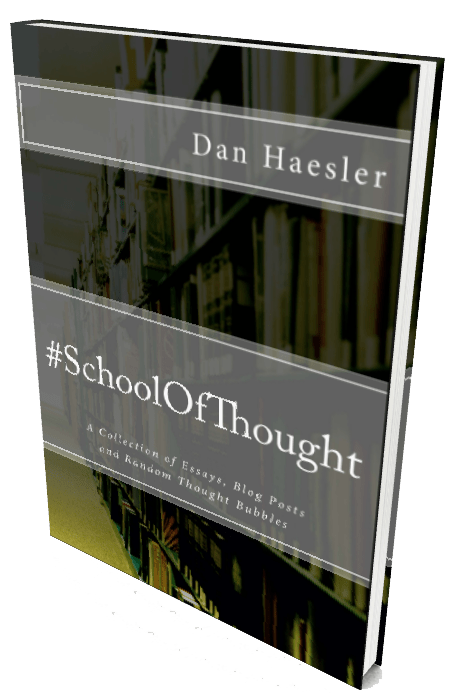 Does having a syllabus “cap” what kids need, and therefore want to learn? Purpose – If the only reason for kids learning something is that it’s on the test, is that good enough? What opportunities could your school provide to really “engage” its students, whilst still delivering the mandatory curriculum? But let’s not just worry about the kids. How “engaged” does your school allow its teachers to be? Thanks for your comment Suzy. I think it’s very important that schools look at helping to promote self determination in their students. Agree completely! The student who understands how to learn and really wants to learn is one who feels secure enough to learn! And that requires teachers who feel secure enough to teach. So the question is – where do we start by making sure that we “go” to our students and are freely able to go to them…top down or bottom up? I’m happy to say that both my girls (yrs 4 and 9) are looking forward to go to school. The younger loves her teacher – best she’s ever had. The older one loves the social side of being at school: schoolwork is just schoolwork although she does love her electives: Music and French, in which she excels. I think they are fortunate to have teachers who not only teach for the test – in fact, most teachers I know don’t just teach for the test. I do have a problem with your notion of autonomy in your post. As an educator and parent, I know that choice is important but also that mostly, kids aren’t mature enough to choose for themselves. As an educator and parent, it is part of our job to expose kids to many experiences and guide them in choosing and in their choices. What this comment means is that fortunately, schools aren’t just about academics – at least, not for my kids but quite likely for a good number of kids. I think we are lucky here in Australia because even though there are cracks in the system – and thank goodness for critical thinking educators – our system works. Let’s make sure it continues to do so…and yes, that means fixing and changing some things. 1. Most teachers you know don’t teach to the test – I’m not saying you’re wrong. But I will highlight a couple of things which spring to mind when you say this. i) How do you know? Teaching must be one of the most isolated professions in as much as we don’t regularly (without warning) see our peers teach. iii) In schools where academic prowess is the major selling point of the institution, I am certain a high level of “teaching to the test” goes on – from my own observations and from feedback from the people I chat to around the country. 2. As an educator and parent, I know that choice is important but also that mostly, kids aren’t mature enough to choose for themselves – Again I’m not saying your wrong, but why are we so afraid of kids making the wrong choices, or in some cases not being able to make any choices? Aren’t these great opportunities for learning? I agree we should guide them… just not too much! Obviously we can’t have endless autonomy. Laws dictate what we can and cannot do… I just wonder if some institutions could encourage more autonomy. 3. Our system works. – I think that very much depends on what criteria we judge it on, and what schools or communities we look at. Thanks again for your comment. It’s great that we can have such interesting discussions! Speak soon! You most likely talk to more teachers than I do but in my experience with peers and my kids’ teachers (I ask my kids and look at what they do), teachers want to enrich student learning and that means going beyond teaching to the test. I don’t think the performance pay model will work in the education industry – too many variables, most notably the people: teachers and students, but also parents and administrators. I say this having had years of experience in the corporate IT industry where I benefited from performance pay. I am not afraid for my kids to make wrong choices – well I am, but I don’t really prevent unless they will seriously harm themselves or others. It’s not about making wrong choices but rather thinking that their choices are limited by what they know or exposed to. I actually like Choice Theory very much. How can you choose something you don’t know about? How do you know you won’t like something given the chance? There are times in life we have to choose for the good of others and this may counter what we like – balancing individual and community can be a real challenge. Exposing students to this spectrum is important and that means navigating the autonomy continuum. Finally, there is no perfect system which is not to say we shouldn’t strive to improve. If you haven’t yet, do listen to John Spencer’s podcast on Education Dystopia; it’s quite enlightening. All I’m saying is that our system here in Australia is better than some countries BUT we must remain vigilant to keep it so and make it better where we can. It seems such a timely topic at the moment, this discussion about engagement. It is certainly something that has been discussed quite a bit in our staffroom. The thought of students becoming being engaged in their own learning process shouldn’t be a radical thought, but it does seem that way. I am not familiar with the model you used (its a good one!) and I am going to have go on a fact finding mission to rectify that. Thanks for your thoughts, it’s through discussion and challenging attitudes that changes happen. The model is talked about in Dan Pink’s book “Drive”. But it is also known as Self Determination Theory which behavioural psychologists believe is the key to engagement, motivation and wellbeing! But we definitely need to encourage and support dialogue between as many teachers as possible… in order to think “professionally” about our profession. Thanks for taking the time to stop by and comment! I really appreciate it. Going through my tabs and found this. haha. I read this story of a science faculty in the US advocating dropping science labs – my heart is broken for the kids. This is the risk we take when we focus too much on tests and teaching to the test. I don’t think Australia is there as such but we must be on-guard. We cannot even allow ourselves to come close to such a situation where teachers – and society, in general – feel that test scores are the be-all and end-all. And perhaps this is my biggest critique of this post in the end: saying “Kids should not go to school” is certainly provocative but it is so open to mis-interpretation. We must promote positivity about schools. Sorry Dan. we shouldnt go to school i dont like school cause we get to much assignments, essays and tests especially maths!!! We can learn from our parents what we need to learn, we can also learn from experiencing things. Which is a better way to learn because your actually doing it. School is where bullies can bully kids that can do anything about it. Teachers dont do anything about it. If kids got taught at home with no negativity, their wouldnt be so many suicides. You may not socialize as much but youll be safe. Why learn about the past when we live in the present and the rules of the world are pretty obvious. These are my reasons as to why we should not need school or make school less harsh. 1) In real life, is our boss going to sit us down and give us an exam on the employment rates and trends on your hometown when you were a teen? Don’t think so. 2) Um… How many of you adults have ever had to use hyperbolas, standard deviation, William Shakespeare or the amount of force used to move an object in real life other than if your job focuses around these things? 3) Throughout the six years of high school, not only are the topics students are forced to learn repeated multiple times, but what is taught isn’t useful in any after-school situation. For example, in the public school curriculum, it is expected for you to study the food pyramid and the Australian Guide to Healthy Eating almost every year since the first grade. This wouldn’t be a problem if the pyramid didn’t tell students to consume twelve serving of wheat a day. The pyramid places the consumption of wheat above anything else, including fruits and vegetables which is a problem as wheat can lead to a deficiency of minerals including calcium, iron, magnesium and zinc, can also potentially damage the pancreas and may account for the rampant serotonin deficiencies, clinical depression, anxiety and some cases of ADHD/ADD. This is just one of the many example of the topics repeated. 4) The topics covered also have no point after school. This is mainly because the topics include analysing Shakespearean plays for English and graphing meaningless equations. School topics like this should be available for students who have an interest in these particular areas like what happens with the elective subjects music, history and art. The subjects should not be made compulsory for a student’s entire schooling career as if they find themselves struggling in the area that the government is forcing them to earn about, then they become a target for bullying and low self-esteem. 5) Bullying and having a low self-esteem are also side effects of the harsh environment that is school. Bullying happens because of many reasons including grades either being too high or too low, being interested in or engaging in topics that goes against what society has portrayed as ‘normal’ and the bullies having their own problems. School creates these problems as bullies are proven to have low self-esteem issues which causes them to make others feel bad in order to feel better about themselves; all this points to schools being the thing that brings about bullies. School is also where a majority of the social standards are created and where being different is treated the worst. Many of the ‘social rejects’ were disowned by friends and family when they were in high school but they just didn’t have enough self-esteem to try and build their reputation back up afterwards. 6) MY HAIR IS LITERALLY FALLING OUT FROM STRESS AT THE MOMENT LIKE GOING BALD NATURALLY IS NOT SOMETHING I SHOULD BE DEALING WITH AT 15 YEARS OLD! 7) Uniforms are terrible and worse than having no uniform. 8) Free time? Social life? No!! The only thing you should care about is school. 9) Remember, even if the teachers don’t care about you, don’t actually teach you anything, you CANNOT say anything bad BECAUSE DON’T YOU KNOW THEY TAKE A LOT OF TIME TO MAKE SURE YOU UNDERSTAND STUFF???????????? 10)I’m so close to giving up and no one knows or notices. Quite frankly, I don’t think they would care. Take care, and if nothing else chat to your parents, a trusted teacher or school counsellor… they absolutely would care about each of these points you raise.